1Dairy Technology, Ethiopian Institute of Agricultural Research (EIAR), Holetta Research Center, Addis Ababa, P.O. Box 2003, Ethiopia. 2*CIRAD-AMIS Agro Alimentaire, Bat 16, TA 40/16, 73 Avenue J.F. Breton, 34398, Montpellier, Cedex 5, France. 3CIRAD-EMVT, 34398 Montpellier, Cedex 5, France. Growth and survival of Salmonella typhimurium DT104 were evaluated during the manufacturing of Ergo (Ethiopian naturally fermented milk) and Ayib (Ethiopian cottage cheese). Three different initial inoculum levels of DT104 (high: ~108 cfu mL-1; medium: ~106 cfu mL-1 and low: ~104 cfu mL- 1) were used. Samples were drawn at 0, 12, 24, 36, 48, 60 and 72 h of fermentation for bacterial enumeration and pH measurements. Ayib was made using defatted fermented milk after 24 and 72 h of fermentation and at three cooking temperatures (50, 60 and 70°C) with sampling being performed at 0, 20, 40 and 60 min of cooking. DT104 survived up to 72 h of fermentation when co-inoculated with Lactic Acid Bacteria (LAB) at high and medium initial inoculum levels, though DT104 population dropped by 3.3 and 5.6 log cfu mL-1, respectively. In the control milk with no LAB, DT104 survived better with only 0.8 log cfu mL-1 reduction in cell number after 72 h of fermentation. When fermented milk (inoculated with or without LAB at 0 or 24 h of fermentation) was cooked at 50°C for Ayib-making, DT104 survived up to 60 min of cooking with survival varied based on initial inoculum level. Complete inhibition was achieved between 20 and 40 min of cooking at 60 and 70°C. Direct consumption of Ergo is not safe. The use of boiled milk with fermentation initiated by a portion of fermented milk resulting from ‘back-slopping’ can be recommended for Ergo-making. For Ayib-making, a minimum cooking temperature of 60°C for at least 40 min is required to ensure the wholesomeness of the product. Salmonella represent one of the major pathogens of the family Enterobacteriaceae. It is the causative agent of serious forms of gastroenteritis. Although all species of Salmonella are virtually pathogenic to humans, Salmonella typhimurium is the most common cause of salmonellosis . Salmonella typhimurium definitive type 104 (DT104) is a recently recognized strain of Salmonella that has emerged as an important pathogen worldwide. This pathogen is of concern not only for its ability to cause illness in many different species of animals, including humans, but also because it is resistant to five commonly used antibiotics (ampicillin, chloramphenicol, streptomycin, sulfonamides, and tetracycline) [2,3]. Although fermented foods are usually considered safe due to the low pH and production of antimicrobial substances by fermenting organisms, human pathogens such as Escherichia coli O157:H7, Listeria monocytogenes and Salmonella enteritidis have been reported to survive and multiply in fermented milks [4,5]. The association of Salmonella and salmonellosis with milk and fermented milk products reported from different countries [6-10], as well as the absence of information in the Ethiopian context prompted us to evaluate the viability of Salmonella typhimurium DT104 during fermentation of milk for Ergo (Ethiopian fermented milk–making and cooking of defatted fermented milk for Ayib (Ethiopian cottage cheese)– making using a challenge test. The challenge test was carried out during fermentation of milk for Ergo-making and cooking of defatted fermented milk for Ayib-making. Composite morning milk from Boran (Ethiopian zebu breed) and Boran x Friesian cows from Holetta Agricultural Research Center (Ethiopia) was used for this study. The strain Salmonella typhimurium DT104 (Ref. 02-7209 – CNR-Salm) (originally a human isolate from France in 2002) was generously offered by François-Xavier WEILL (Pasteur Institute, Paris). The bacterium is resistant to ampicillin, streptomycin, chloramphenicol, sulfamide and tetracycline. A mixture of cocci and rode shaped lactic acid bacteria (LAB) isolated from naturally fermented milk that were Gram+, catalase– and oxydase– was used to initiate fermentation. Before undertaking the challenge test, this LAB mixture was inoculated in sterile milk and left to ferment at ambient temperature for about 36 h. This fermented milk was then examined for its organoleptic properties by a panel of 4 persons and confirmed to conform to the characteristics of naturally fermented milk. Milk was autoclaved at 120°C for 15 min and aseptically distributed into sterile screw-capped bottles to get final volumes of approximately 200 mL in each bottle. Milk was then left to ferment at ambient temperature (22–27°C) for about 72 h according to the usual practice of smallholder producers in the study area. Viable counts of DT104 and LAB were determined together with pH (measured using a digital pH meter). 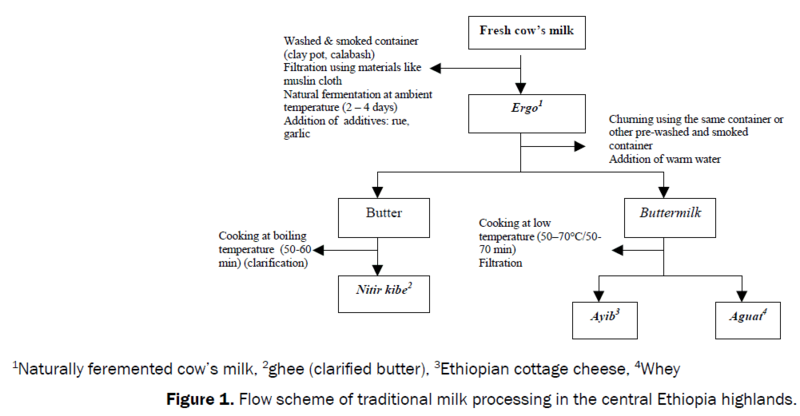 Figure 1: Flow scheme of traditional milk processing in the central Ethiopia highlands. Experiment 1: Ayib-making from Ergo after 72 h of fermentation at ambient temperature. DT104 was inoculated in milk at 0 h fermentation. Experiment 2: Ayib-making from Ergo after 24 h of fermentation at ambient temperature. DT104 was inoculated at 0 h fermentation. Experiment 3: Ayib-making from Ergo after 24 h of fermentation at ambient temperature. DT104 was inoculated at 24 h fermentation prior to the start of cooking. In all cases, the cream layer was removed aseptically from the fermented milk before the start of the cooking. Three initial inoculum levels of DT104 were used: High (~108 cfu mL-1), medium (~106 cfu mL-1) and low (104 cfu mL-1). A positive control (104 cfu mL-1) with no LAB was also used. LAB was inoculated to give ~106 cfu mL-1 to initiate fermentation. Initial inoculum levels were estimated by adjusting to Mac Farland standard corresponding to concentration of microbial suspension. Suspensions were prepared in buffered peptone water from overnight grown DT104 culture on nutrient agar and in MRS broth from culture grown on MRS agar (48 h at 35°C). For the fermentation experiment, 1 mL portion of the fermenting milk was drawn at 0, 12, 24, 36, 48, 60 and 72 h of fermentation and for Ayib-making experiments, 1 mL or g of products was drawn at 0, 20, 40 and 60 min of cooking from each treatment and the control groups. Test portions were directly mixed in test tubes containing 9 mL of buffered peptone water (BPW) (Oxoid, UK) for DT104 and MRS broth (Oxoid, UK) for LAB. 0.1 mL of appropriate dilutions was surface plated on duplicate Xylose- Lysine-Desoxycholate (XLD) agar (Oxoid, UK) plates for the enumeration of viable DT104. LAB was enumerated after culturing duplicate surface plated MRS agar plates in an aerobic jar at 35°C for 48 h.
Each trail was carried out in four replications. Counts of DT104 and LAB determined during the challenge tests were transformed to log10 values. These log transformed values (log10 cfu mL-1 or g-1) and pH determined at each sampling time of the test portion from the fermenting milk were analyzed using the General Linear Model (GLM) of the Statistical Analysis System . Least Significant Difference (LSD) test was used to separate means and differences were considered to be statistically significant at P<0.05. The changes in the DT104 and LAB population in fermenting milk at ambient temperature are shown in Figure 2. At high initial inoculum level, DT104 population and pH decreased progressively throughout the fermentation. At the end of fermentation at 72 h, DT104 count dropped by 3.3 log cfu mL-1 (P<0.05) as compared to the initial inoculum level. At medium and low initial inoculum levels, DT104 population increased up to 24-36 h of fermentation then dropped progressively up to the end of fermentation. At 72 h of fermentation, DT104 count decreased by 5.6 log cfu mL-1 at medium initial inoculum level and dropped to below platingdetection limit (<10 cfu mL-1) at low initial inoculum level. Within the first 24 h of fermentation, pH of the fermenting milk in the three initial inoculum levels dropped from ~6.7 to ~4 (at which time LAB population tended to increase) and maintained at this level up to the end of fermentation. In the control milk with no LAB, DT104 survived better with only 0.8 log cfu mL-1 reduction in cell number after 72 h of fermentation. Figure 2: Survival of Salmonella typhimurium DT104 (♦) and lactic acid bacteria (◾); and change in pH (▲) during fermentation of milk with (a) high: 108 cfu mL-1, (b) medium: 106 cfu mL-1 and (c) low: 104 log cfu mL-1; and (d) control: 104 cfu mL-1 (with no lactic acid bacteria) initial inoculum levels of DT104. At the start of cooking at 50, 60 and 70°C, DT104 counts were 5.4 (high), 2.0 (medium) and 5.7 log cfu mL-1 (control); while LAB counts were 4.0, 4.0, and 5.6 log cfu mL-1 at high, medium and low initial inoculum levels, respectively (Figure 3). At 20 min of cooking and on wards at 60 and 70°C Ayib-making temperatures, both DT104 and LAB were below the plating-detection limit (<10 cfu mL-1) even after overnight enrichment (data not shown). DT104 dropped by 2.5 and 1 log cfu mL-1, respectively at high and medium initial inoculum levels within 20 min of cooking at 50°C (Figure 3). In the absence of LAB, DT104 dropped by 2.9 log cfu mL-1. Complete inhibition of DT104 was achieved between 20 and 40 min of cooking at 50°C. LAB counts dropped gradually up to 40 min of cooking and were not detected at 60 min of cooking at 50°C (Figure 3). Figure 3: Survival of Salmonella typhimurium DT104 (a) and lactic acid bacteria (b) during the manufacturing of Ayib at 50 °C with high: 108 cfu mL-1 (♦), medium: 106 cfu mL-1 (◾) and low: 104 cfu mL-1 (▲) initial inoculum level of DT104 (Ayib made from Ergo after 72 h of fermentation). Experiment 2: Ayib-making: Raw material Ergo after 24 h fermentation, DT104 co- inoculated in milk with LAB at 0 h fermentation. The growth and survival of DT104 and LAB during cooking of defatted fermented milk are presented in Figure 4. DT104 population decreased by 5.2 log cfu mL-1 after 60 min at 50°C cooking temperature at high initial inoculum level. With the absence of LAB, DT104 survived better with 4.2 log cfu mL-1 reduction after 60 min of cooking at 50°C. At medium and low initial inoculum levels, DT104 count declined to below plating-detection limit after 60 and 40 min of cooking at 50°C, respectively (Figure 4). At 60 and 70°C cooking temperatures, DT104 population decreased dramatically (p<0.05) after 20 min of cooking at all initial inoculum levels with or without LAB and was not detected when determined at 40 min of cooking (Figure 4). LAB counts decreased from a mean count of about 8 log cfu mL-1 at the start of cooking at 50 and 60°C cooking temperatures to around 3 log cfu mL-1 at the end of cooking at 50°C, while at 60°C cooking temperature, counts were below plating-detection limit even after enrichment (p<0.05). Figure 4: Behavior of DT104 during Ayib-making at 50°C (a), 60°C (b), and 70°C (c) and LAB at 50°C (d) and 60°C (e) cooking temperatures (Ayib made from Ergo after 24 h fermentation, inoculation at 0 h fermentation). DT104 initial inoculum level: high: 108 cfu mL-1 (♦), medium: 106 cfu mL-1 (◾), low: 104 cfu mL-1 (▲) and control: 10`4 cfu mL-1 (with no lactic acid bacteria) (❎). The changes in DT104 and LAB population are shown in Figure 5. DT104 survived heating at 50°C up to 60 min with reduction in cell count by 5.9, 4 and 2.5 log cfu mL-1 for high, medium and control initial inoculum levels, respectively; while at low initial inoculum level, DT104 dropped by 1.9 log cfu mL-1 after 40 min of cooking and was below plating-detection limit after 60 min (Figure 5). Figure 5: Fate of DT104 at 50°C (a), 60°C (b), and 70°C (c) and LAB at 50°C (d), 60°C (e) and 70°C (f) cooking temperatures during the manufacturing of Ayib (Ayib made from Ergo after 24 h fermentation, inoculation at 0 min of cooking) with high: 108 cfu mL-1 (♦), medium: 106 cfu mL-1 (◾), low: 104 cfu mL-1 (▲) and control: 104 cfu mL-1 (with no lactic acid bacteria) (❎) initial inoculum levels of DT104. DT104 survived up to 60 min at 60 and 70°C cooking temperatures when inoculated with the absence of LAB with reduction in count from 6.3 and 5.4 log cfu mL-1 at the start of cooking to 2.2 and 1.5 log cfu mL-1, respectively (p<0.05) at the cooking temperatures indicated above. However, DT104 when co-inoculated with LAB was not detected when determined after 40 min of cooking at both temperatures. LAB survived cooking at 50°C up to 60 min with progressive reduction in number from 6.2, 6.3 and 6.0 cfu mL-1 at the start of cooking to 2.7, 2.0 and 1.9 cfu mL-1 at the end of cooking, respectively for high, medium and low initial inoculum levels. LAB was detected after 20 min of cooking at 60°C but at 70°C cooking temperature no viable LAB was detected by this time. Published studies on the behaviors of Salmonella typhimurium DT104 during traditional food manufacturing such as milk processing are generally scarce in the Ethiopian condition. The present study focused on assessing the growth and survival of DT104 during the fermentation of milk at ambient temperature for Ergo–making and heating of defatted fermented milk for the manufacturing of Ayib. Acidity and pH, as well as heat treatment, are important factors, which influence the growth and survival of pathogens in foods . The antimicrobial action of organic acids is generally well known . The inhibitory effect of fermented milk particularly on Salmonella spp. is documented . In yogurt, lactic acid was reported to be the main inhibitory factor active against Salmonella typhimurium . This supports the results of the present finding where DT104 population decreased with the advancement of milk fermentation. In the present study DT104 survived milk fermentation better at high than low initial inoculum level indicating that the degree of inhibition was dependent on the initial inoculum level of the pathogen. Different mechanisms of inhibitory effects of fermented dairy products are documented. Organic acids exert their effect through their undissociated molecules, with the activity of the acids being dependent on pH, which determines the degree of dissociation. At low pH, the proportion of undissociated molecules is greater than at pH approaching neutrality . Rubin  on the other hand indicated a direct correlation between the increase in casein concentration and length of survival of Salmonella in yogurt whey. The casein, according to El-Gazzar and Marth , exerts a protective layer effect on Salmonella typhimurium in acid dairy products and that the degree of protection depends on the casein concentration, the form of the casein molecule and the pH. The minimum pH at which Salmonella can initiate and sustain growth, as indicated by El-Gazzar and Math , is a function of the serotype, the temperature of incubation, and the nature and composition of the growth medium. Minimum pH at which Salmonella initiated growth under optimum laboratory conditions were for instance reported to be 4.05 when broth was adjusted with hydrochloric or citric acid . The optimum pH being between 6.5 to 7.5 . Multiplication of Salmonella at pH value of 4.4  and 5.2 to 5.3 [18,19] was also reported. In the current study, however, DT104 survived pH of 3.8 up to 72 h in fermenting milk with pH dropping progressively from about 6.7 at 0 h fermentation. This finding agrees with that of Ashenafi  who reported that Salmonella enteritidis and Salmonella typhimurium survived up to 48 to 60 h of milk fermentation in smoked containers at ambient temperature. However, he reported that complete inhibition was achieved in samples where pH dropped to 3.7. Acid tolerance response in Salmonella typhimurium, as indicated by Jung and Beuchat , is induced by exposure to acids, which enhances subsequent resistance to extreme acidic environments (pH 3.0). Acid adaptation seems to increase the viability of DT104. The work of Samelis  for instance revealed that non acid adapted Salmonella typhimurium DT104 populations declined by 4.1 log cfu mL-1 when exposed to lactic acid (pH 3.5) for 120 min at 30°C, while the corresponding declines of acid-adapted populations were only 1.6 log cfu mL-1. Leyer and Johnson  also reported that acid adapted Salmonella cells had increased resistance to organic acids found in fermented dairy products and that they survived better than non-adapted cells during fermentation of milk and in cheeses stored at 5°C. In Ethiopia, Ergo is usually consumed directly after 24 h of fermentation at room temperature due to its preferred flavor . However, according to the current study, DT104 survived up to 72 h of fermentation depending on the initial inoculum level. When fermented milk (inoculated with or without LAB at 0 or 24 h of fermentation) was cooked at 50°C for Ayib-making, DT104 survived up to 60 min of cooking with survival varied based on initial inoculum levels. D’Aoust  indicated that heating milk at 60°C produced only a 2 log10 reduction in the number of viable Salmonella but complete inhibition was not achieved. In the present study, complete inhibition of DT104 was achieved between 20 and 40 min of cooking at 60 and 70°C. Exposure of Salmonella typhimurium to various stresses has been demonstrated to enhance resistance to heat. Leyer and Johnson  for example indicated that acid adapted Salmonella typhimurium had increased tolerance towards heat. This finding warrants some precaution in the use of sub-pasteurization heat treatment during food processing, a prevailing practice during traditional Ayibmaking in Ethiopia. Since Idziak and Suvanmonkol  reported that virulence of Salmonella typhimurium increased under acidic conditions, a low infectious dose of cells could cause illness in an acidic environment such as Ergo. Ergo is therefore not safe for direct consumption. The use of boiled milk with fermentation initiated by a portion of fermented milk resulting from ‘back-slopping’ can be recommended for Ergo-making. For Ayib-making, a minimum cooking temperature of 60°C for at least 40 min is required to ensure the wholesomeness of the product. The financial support of the French embassy in Ethiopia and International Foundation for Science (IFS) and the technical assistance of Andinet GETACHEW are duly acknowledged. Madigan MT, et al. Brock Biology of Microorganisms. 9th ed. South Illinois University Carbondale, Prentice Hall, Upper Saddle River, USA 2000. Wall PG, et al. A case control study on infection with an epidemic strain of multi-resistant Salmonella Typhimurium DT104 in England and Wales,Communicable Dis. Rep. Rev1994; 4:130-135. Threlfall EJ, et al. Increasing spectrum of resistance in multiresistant Salmonella Typhimurium,Lancet. 1996; 347: 1053-1054. Feresu SB and Muzondo MI. Fate of pathogenic and non-pathogenic Escherichia coli strains in two fermented milk products in Zimbabwe, MIRCEN J. Appl. Microbiol. and Biotechnol.1990; 5, 349-355. Fabre JM and Peterkin PI.Listeria monocygenes: a food borne pathogen,Microbiology Review 1991; 55, 476-511. Desenclos JC, et al. Large outbreak of Salmonella enterica serotype paratyphi B infection caused by a goats' milk cheese, France, 1993: a case finding and epidemiological study,BMJ, 1996; 312:91-94. IFST. Salmonella Typhimurium DT 104. The Institute of Food Science & Technology (IFST), 5 Cambridge Court, 210 Shepherd's Bush Road, London W6 7NJ, UK 1997. Cody SH, et al. Two outbreaks of multidrug-resistant Salmonella serotype Typhimurium DT104 infections linked to raw-milk cheese in Northern California,JAMA 1999; 281:1805-1810. Reij MW and Den Aantrekker ED. Recontamination as a source of pathogens in processed foods,Inter. J. Food Microbiol 2004; 91: 1-11. El-Gazzar F and Marth EH.Salmonella, Salmonellosis and dairy products: A review,J. Dairy Sci 1992; 75: 2327-2343. SAS User's guide: Statistics, version 5, SAS Institute. Statistical Analysis System (SAS),Inc. Cary, NC 2011. Jung YS and Beuchat LR.Sensitivity of Multidrug-resistant Salmonella Typhimurium DT104 to organic acids and thermal inactivation in liquid egg products,Food Microbiol 2000; 17: 63-71. Alm L.. Survival of Salmonella and Shigella in fermented milk products with and without added human gastric juice: an in vitro study,Prog. Food Nutr. Sci 1983; 7:19-28. Rubin HE, et al. 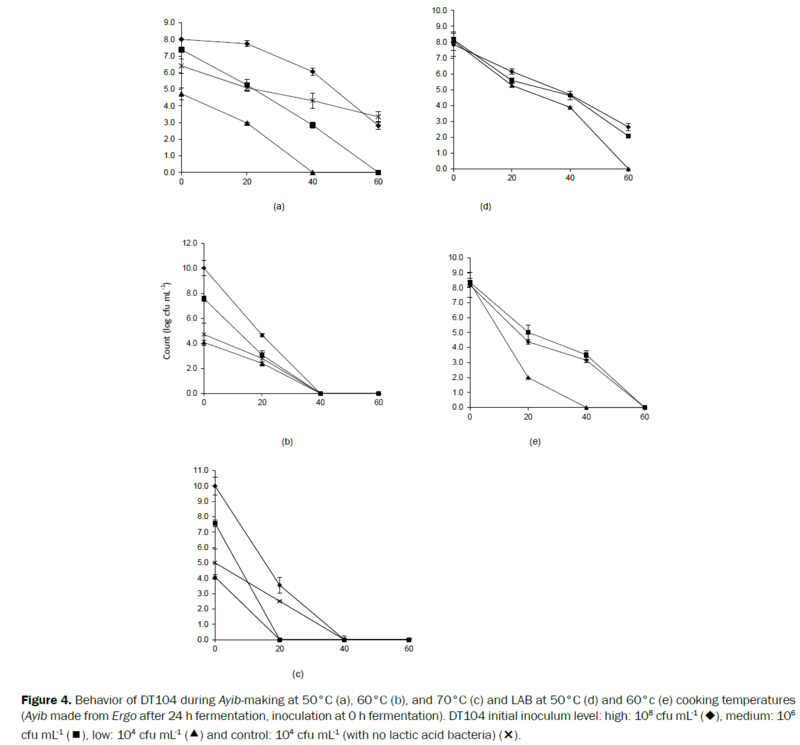 Lactate acid inhibition of Salmonella Typhimurium in yogurt,J. Dairy Sci 1982; 65: 197–203. Rubin HE. 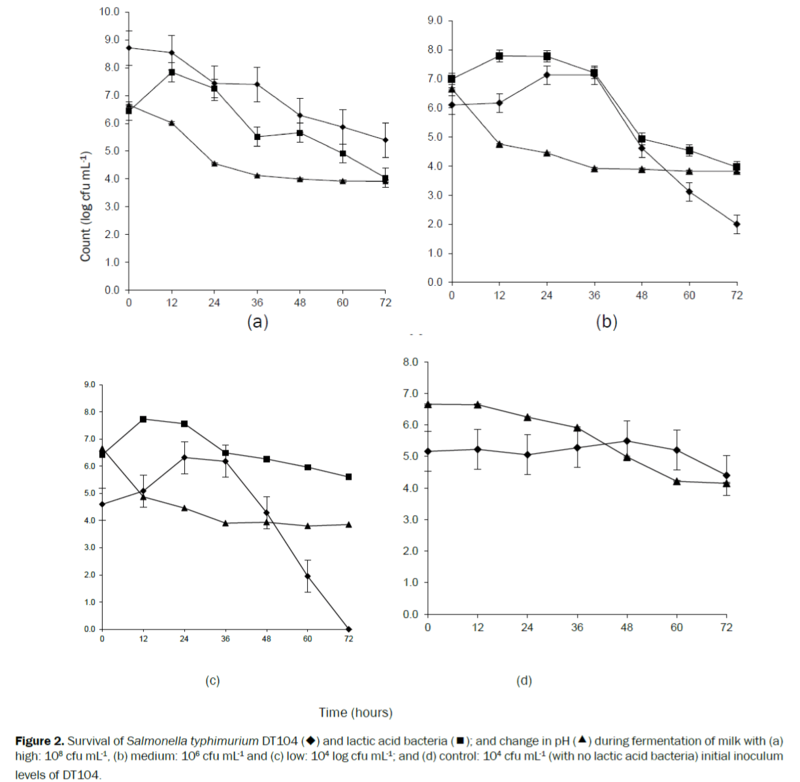 Protective effect of casein towards SalmonellaTyphimurium in acid-milk,J. Appl. Bacteriol.1985; 58:251-255. D’Aoust JY, et al.Salmonella species. In Food Microbiology, Fundamentals and Frontiers,Washington, DC, USA. American Society for Microbiology1993; 129-158. Chung KC, et al. Growth of Salmonella at low pH,J. Food Sci1970;35: 326-28. Leyer GJ and Johnson EA. Acid adaptation promotes survival of Salmonella spp, in cheese. Appl. Envirn. Microbiol 1992;58: 2075-2080. Samelis J, et al. Evaluation of pH-dependent stationary phase acid tolerance in Listeria monocytogenes and Salmonella Typhimurium DT104 induced by culturing in media with 1% glucose: a comparative study with Escherichia coli O157:H7,J. Appl. Microbiol 2003; 95: 563-575. Ashenafi M. Fate of Salmonella Enteritidis and Salmonella Typhimurium during the fermentation of Ergo, a traditional Ethiopian sour milk. Ethiop. Med, J 1993; 31: 91-98. D’Aoust JY, et al. Thermal inactivation of Salmonella species in fluid milk,J. Food Prot 1987; 50: 494-501. Leyer GJ and Johnson EA. Acid adaptation induces cross-protection against environmental stresses in Salmonella Typhimurium, Appl. Envirn. Microbiol 1993;59:1842-1847.